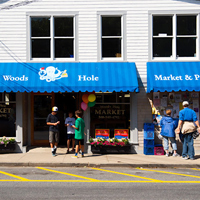 Woods Hole Market & Provisions is located just over the one- man operated drawbridge and on picturesque Eel Pond in the heart of Woods Hole village. Giving a nod to our famous scientific community, look for the Octopus and Blue Striped awning and you will be glad you made the crossing. Carrying on as the only store for generations in this salty, nobel-prize winning throwback, we pride ourselves as a market that offers the community a place where locals can depend on customer service like the good old days . Our store is stocked with wonderful products that feature organic, gluten free, vegetarian and the traditional. We offer fresh butchered meats and our own burger that is ground daily, Boars Head Meats & Cheese line, delicious sandwiches, subs, wraps and homemade Burritos, fresh and locally grown produce, baked goods, block ice & regular, Jims Organic Coffee and our Award Winning Gourmet Scratch Pizza. Make sure you try our Farm Fresh milk in glass bottles, especially the Chocolate and you will be hooked. Of course being seaside, fresh fish by the lb. is offered seasonally. Enjoy our Clambakes To Go or our own Steamed or Fresh Lobsters for the whole gang. As a true grass roots supporter of the local farm to market movement, we pride ourselves in carrying locally made products and quality goods. Basically, if you need it, we have it and if we don’t just ask and we will try our darnest to get it. While you’re here, enjoy our waterside seating on our upper and lower decks for breakfast, lunch or dinner and catch a few rays at the same time. We are open year round, 7 days a week, offering delivery services to the mariners and landlubbers. 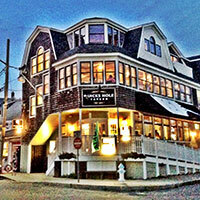 Also, visit our other location, The West Falmouth Market in West Falmouth Village, just off the Shining Sea Bikepath . This is the original antique at 117 years old and a legacy to the locals and tourists.